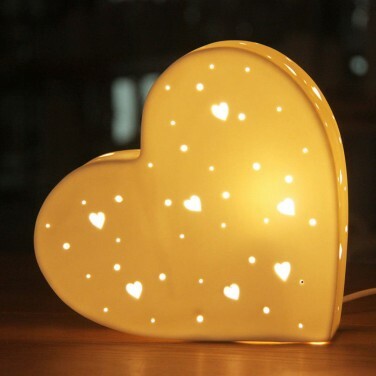 Cast soft heart shaped silhouettes into your child's room from this stunning ceramic heart shaped lamp. Transform your child's space with a comforting warm white glow from this stunning heart shaped table lamp. 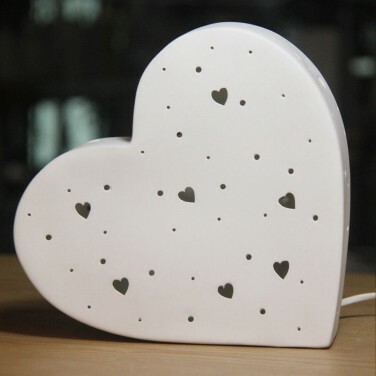 Made from stylish white porcelain, this elegant lamp is detailed with mini heart cutouts and pin point detailing so that heart shaped shadows are projected onto surrounding surfaces. An inline switch allows for easy placement and it's stylish neutral colour allows it to fit with most colour schemes. A very sweet night light, this porcelain car lamp will fill your child's room with a warm and cosy glow. A sparkling star nightlight that shines with a warm white glow to offer the comfort of light at night. Gently illuminate your child's room at night with a warm white glow from this stunning crescent moon lamp.